About once a month (maybe more, maybe less), Tomato Dirt publishes a fun profile of a specific tomato variety. The idea behind Tomato of the Month is to help you get to know different types of tomatoes better. There are so many types of tomatoes! Understanding tomato varieties can be intimidating. There are scores and scores of them. 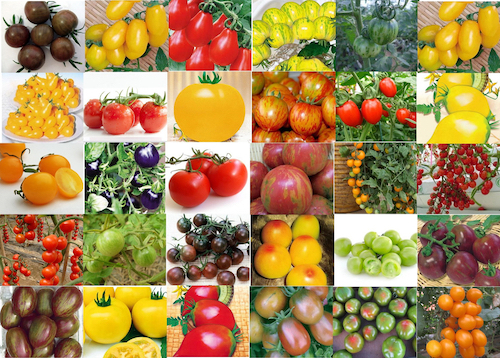 Some experts estimate that there are up to 25,000 types of tomatoes to choose from. And plant breeders (as well as home gardeners) are creating new cultivars all the time. But at Tomato Dirt, we believe you don’t need to be an expert in tomato horticulture in order to enjoy growing them. You simply need to know the basics. Tomato gardening is most definitely a “learn-as-you-grow” proposition. Season to season, you learn more and more – while enjoying fresh tomatoes along the way. The Tomato of the Month helps you get up close and personal with one tomato variety at a time. It’s fun to pick up interesting and helpful facts about different types of tomatoes. And it can be helpful if you’re wavering about which varieties to grow. As you get to know different tomato varieties, you’ll accumulate a lot of information without even knowing it. Pretty soon, your neighbors will ask you for advice. You’ll become a “neighborhood tomato expert” without even trying. There’s no scientific formula. We just pick types of tomatoes that are interesting. Or they may be solid, dependable varieties. They may be especially prolific or flavorful or able to resist disease. Or they may share a fun bit of tomato history. You may even be inspired to try to grow some of them yourself! And please let us know if you’d like us to considering profiling a particular tomato variety. Just pop us an email. Heirloom tomato varieties vs. hybrid tomatoes: what's the difference?